The Sandwich System is the premier polyurethane track system. The Sandwich System is installed in multiple applications. First a base mat of Black EPDM/Binder is mixed and machine applied to a minimum thickness of 8mm. Once cured, a highly sophisticated intermediate coat is squeegeed onto the base mat assuring that all the pores of the mat are sealed. 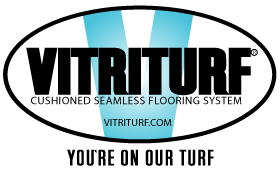 The VITRITURF Sandwich System Finish coat, a 100% solids polyurethane resin is then applied with a notched squeegee. While wet colored EPDM granules 1-4mm are broadcast onto the surface. The finished track is one which exhibits tremendous durability, uncanny quickness and a remarkable appearance.